Report on multiple tests, using search filter for panelist IDs, panelist #1052 in this example, and optional filters by Attribute Descriptions, Sample Descriptions, Test Dates. 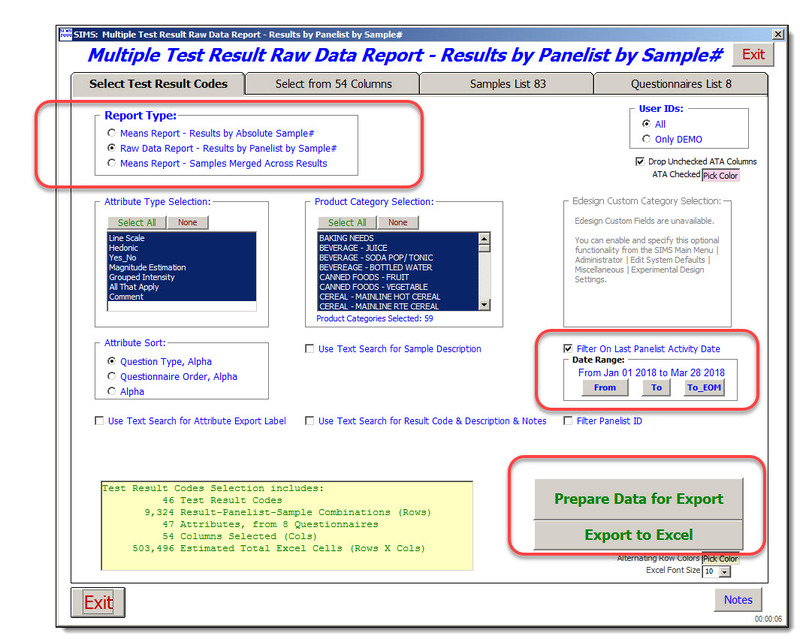 Attributes export label names created by SIMS technicians with consistency allow for fairly easy tracking of panelist performance across multiple tests. This SIMS report is also known as the Multiple Tests Means Reports. 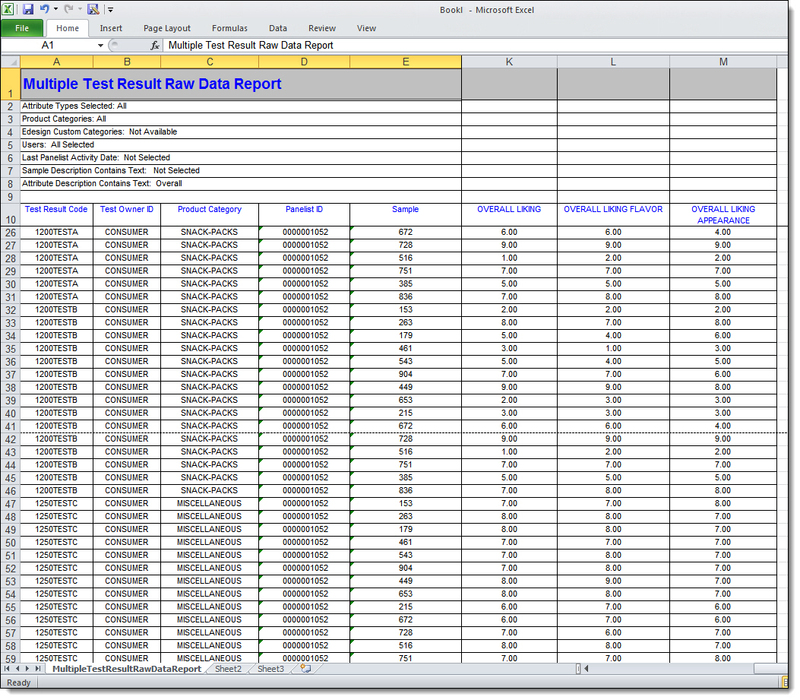 Print Screen of Panelist Performance Multiple Tests Reports - In Microsoft EXCEL. Print Screen of Panelist Performance Multiple Tests Reports setup screen Sensory Technicians. 1. Print Screen of Panelist Performance Multiple Tests Reports - In Microsoft EXCEL. The Multiple Result Means Report lists the mean value of each tested attribute by result and sample. Each row of the report represents a different Test Result and Sample combination. Each attribute column of the report shows its associated Attribute Description. is in fact the same attribute which may have been presented to panelists in different tests. Each value in a specific row-column is the mean value of that attribute for the associated Test Result and Sample. The Multiple Result Raw Data Report lists the raw data value of each tested attribute by result and sample. Each row of the report represents a different Test Result and Panelist and Sample combination. value of that attribute for the associated Test Result and Panelist and Sample. The Multiple Result Means Report lists the mean value of each tested attribute across all results. Each row of the report represents a different Sample. Each value in a specific row-column is the mean value of that attribute for the associated Sample.